It is said that we live at the beginning of the “Digital Age” This should influence all areas of life, especially also geography as a science. In contrast geography, its concepts, theories and way of thinking also impacts diverse aspects of the Digital Age. Such interdependency are presented and discussed in this talk. First there are spatial big data, which are the base for many empirical studies undertaken in geography since decades. Starting with quantitative as well as structured data many years ago nowadays also qualitative as well as unstructured data, like texts, images, videos etc. are available and used. The schemes and models of open, linked and user generated spatial data, which have been developed in geography or for OGC specifications, are very important sources for the structures, links and processing models for spatio-temporal data in the Digital Age. Secondly there are the spatio-temporal aspects in a digital world which is analysed and studied in geography since many years. Starting from the concepts by Thorsten Haegertstrand’s “Time Geography” many other like the “Models of Spatial Processes” by Arthur Getis and Barry Boots are described. These concepts can be the basis for spatio-temporal analytics and predictions in a modern data-based view of the world. Reflections from the GI-Science, like the „Language for Spatial Computing“ by Werner Kuhn or „The Language of Spatial Analysis“ by ESRI are the basis for the third aspect, the functions, which use the big data in concepts to contribute to problem solving in the Digital Age. These three aspects of the Digital Age are consolidated in a final application for the management of wood fuel for power stations, discussed and criticised. It will be clear that the Digital World is ubiquitous today. It is very useful as a modern pragmatic information tool if it is applied correctly and critically. 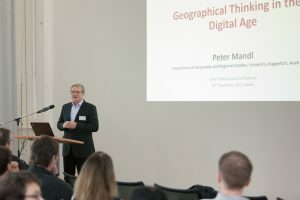 In this talk it is shown and suggested what “geographical thinking” can contribute to the practice of the Digital Age.